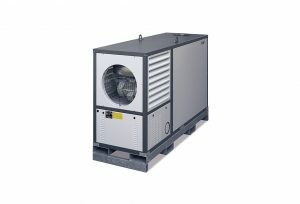 Larger Output Indirect Mobile Warm Air Heaters – Mobile and instantly ready to use – The HM series is an exciting and innovative range of robust, versatile, and highly efficient indirect oil or gas fired mobile and portable warm air heat generators with outputs 100kW or 200kW, as standard and larger outputs on request. It is especially suitable for use in various locations, such as large marquees, building sites, warehouses ,construction sites, outdoor events and marquees, temporary storage facilities, crop drying, frost protection, warehousing, plant and building refurbishment, process heating, building drying and dehumidification, ship building and refitting, garages, temporary heating within industrial and commercial units, greenhouses and agriculture, in theatre military uses, and many more,as an additional, temporary or replacement heating unit. 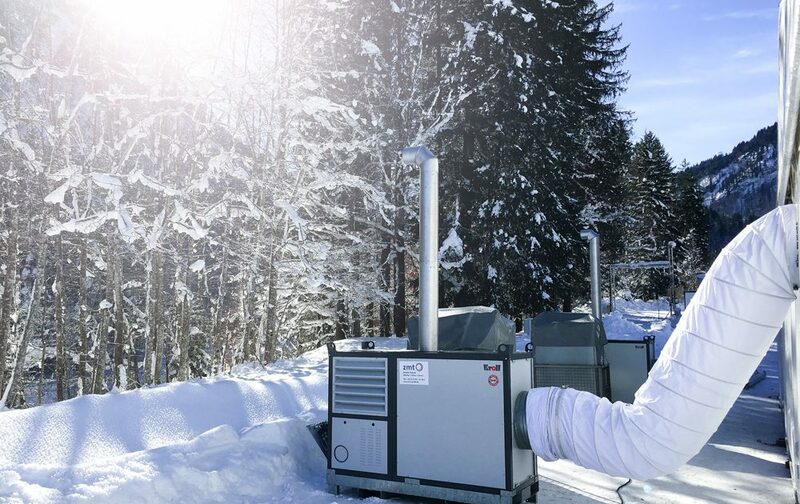 The Kroll range of HM indirect oil or gas mobile site heaters are a highly fuel efﬁcient indirect site heater providing a fast and effective solution to a wide range of applications requiring 100% CO2 fume free heating. Due to thermostatic controls, the unit can be left to run unattended for long periods of time, for a fully automatic heating system, or even a frost protection system. The Kroll warm air heater is of a compact construction. There are no parts protruding from the casing, the flue gas connection is countersunk. The air inlet and air outlet fittings can be stored internally for transport. The unit has got fork lift openings on all sides and lifting eyes are fitted as standard, and the models within the range are designed so they can be stacked when not in use. Another benefit for rental companies, is that the units fits crossways on a standard lorry as it is easily and safely stackable. All components of the unit, such as burner, fan, control box etc. are enclosed within the robust housing, meaning the heating unit is therefore protected against abuse or misuse by any unauthorized persons. The energy is converted directly and with a degree of efficiency of 93 %. Due to the variable air intake, the units can operate with recirculated air, fresh air or a mixture of both. The elevated pressure of 350 – 400 Pa allows the use of long warm air hoses. 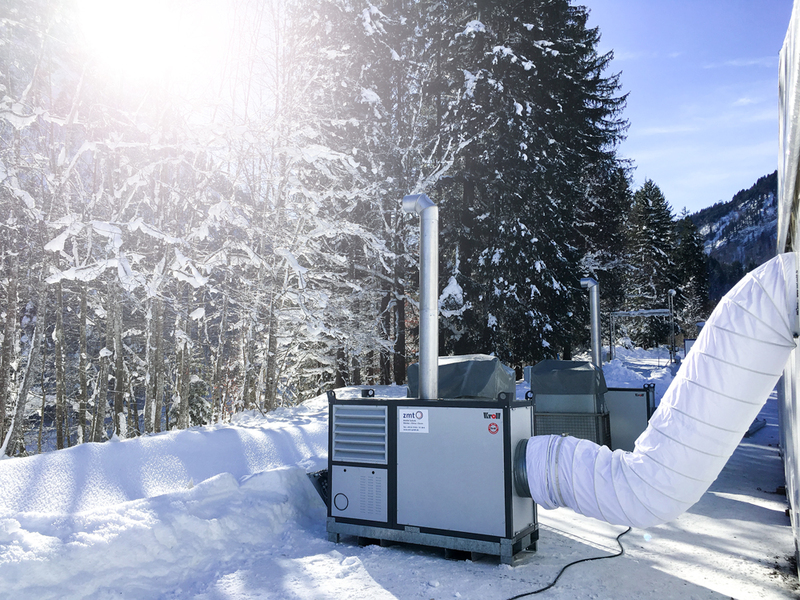 The heat can be distributed via one single or several warm air hoses, this feature gives you more options in locating the heater on site. The casing is galvanized and painted in a colour similar to RAL 7047. The unit is easy to maintain, all component parts are positioned in a clearly arranged manner, and, thanks to removable side panels, easy to reach. These Kroll larger output indirect mobile warm air heaters, with its construction and equipment components fulfils the special needs and demands of the rental market for high functionality, cost-effectiveness and long-term service life.